MMS AUGUST 2018 70 mmsonline.com IMTS 2018 portability (including units that move by them- selves) are making robotic automation more viable for small-batch/high-mix production. Still, we expect much of the big automation news at IMTS to be driven by developments in leveraging data, and in software driven by increasingly powerful computers. Systems for connectivity, predictive analytics and more are designed specifically for robots. A confer- ence co-located with IMTS, the fourth Global Automation & Manufacturing Summit (GAMS), lists robotics alongside the IIoT and cybersecurity as chief topics of focus. Software automation can even facilitate the additive manufacturing process. Consider gener- ative design, in which computers work from predefined constraints to generate thousands of possible design iterations. With the complex lattice structures made possible by additive manufac- turing, such capability can be particularly useful for sparking engineers' imaginations and acceler- ating product development at the outset. 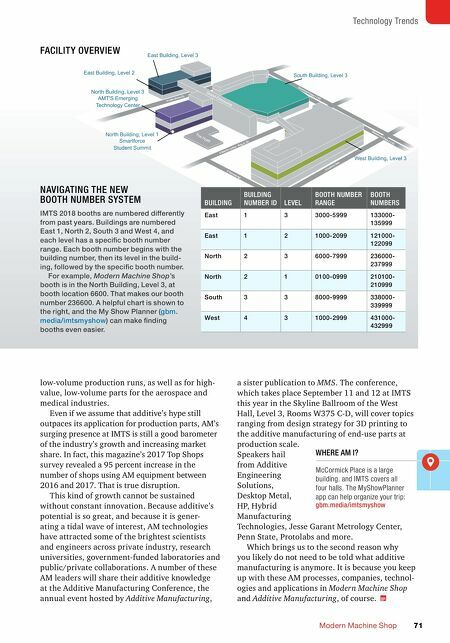 Additive Has Arrived Four years ago when MMS covered trends to watch for at IMTS 2014, additive manufacturing (AM) was the lead item. Back then, as it is now, additive was emerging both in terms of its technological capacities and as a presence at IMTS. 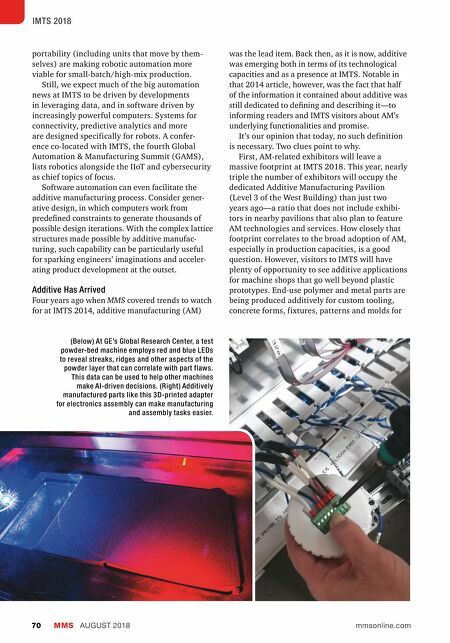 Notable in that 2014 article, however, was the fact that half of the information it contained about additive was still dedicated to defining and describing it—to informing readers and IMTS visitors about AM's underlying functionalities and promise. It's our opinion that today, no such definition is necessary. Two clues point to why. First, AM-related exhibitors will leave a massive footprint at IMTS 2018. This year, nearly triple the number of exhibitors will occupy the dedicated Additive Manufacturing Pavilion (Level 3 of the West Building) than just two years ago—a ratio that does not include exhibi- tors in nearby pavilions that also plan to feature AM technologies and services. How closely that footprint correlates to the broad adoption of AM, especially in production capacities, is a good question. However, visitors to IMTS will have plenty of opportunity to see additive applications for machine shops that go well beyond plastic prototypes. End-use polymer and metal parts are being produced additively for custom tooling, concrete forms, fixtures, patterns and molds for (Below) At GE's Global Research Center, a test powder-bed machine employs red and blue LEDs to reveal streaks, ridges and other aspects of the powder layer that can correlate with part flaws. This data can be used to help other machines make AI-driven decisions. (Right) Additively manufactured parts like this 3D-printed adapter for electronics assembly can make manufacturing and assembly tasks easier.